Switch connected to the S1 terminal is a master switch. It starts the learning mode (Add/Remove). The switch connected to the S1 terminal will switch load connected to the Q1 terminal and switch connected to the S2 terminal will switch load connected to the Q2 terminal. Functionality of the switches can be reversed by adjusting advanced parameter. While adding the device to the network with connected toggle switch, ensure that all switch contact is open (off). Otherwise it will prevent adding/removing the device to/from the network. The device responds to commands ALL ON/ALL OFF that may be sent by the Z-Wave controller. ALL ON/ALL OFF commands are usually implemented in the remote controllers using Z-wave protocol, and they are used to issue commands directed to the entire system. By default, both commands ALL ON and ALL OFF are accepted. Settings may be changed by modifying the value of parameter 1. In this way the user may determine to which commands the device should respond. The device may respond in the following manner to received data-frames (settings are configured by the advanced parameters). 1st Association Group is assigned to S1 terminal – sending command frames to the associated devices whenever button connected to S1 terminal is pressed. 2nd Association Group is assigned to S2 terminal – sending command frames to the associated devices whenever button connected to S2 terminal is pressed. FIBARO Double Relay Switch in 1st and 2nd group allows to control 5 regular and 5 multichannel devices per an association group. 3rd group is reserved solely for the controller and hence only 1 node can be assigned. Wait for the configuration process to end. Sending relevant information to devices added to associated groups may take even a few minutes. FIBARO Double Relay Switch allows to customize its operation to user’s needs. The settings are available in the FIBARO interface as simple options that may be chosen by selecting the appropriate box. Allows to activate/deactivate ALL ON / ALL OFF functions. 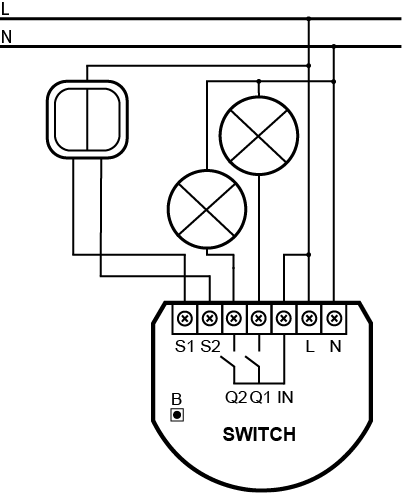 Auto off relay after specified time, with the possibility of manual override – immediate Off after button push. 0 – manual override disabled. After single button push the relay turns on and automatically turns off after specified time. 1 – manual override enabled. After single button push the relay turns on and automatically turns off after specified time. Another button push turns the relay off immediately. Relay will turn off automatically after time specified in this parameter. 1 – commands are sent when the device is turned off. Turning on the device does not send control commands. Double-clicking button sends ‘turn on’ command, dimmers memorize the last saved level. 2 – commands are sent when the device is turned off. Turning on the device does not send control commands. Double-clicking button sends ‘turn on’ command and dimmers are set to 100% brightness. 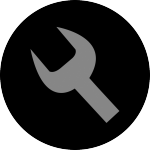 Assigns status of the toggle (bistable) switch to status of the device. Enabling this option allows the user to dim lighting/shut roller by associating Dimmer/Roller Shutter Controller. Hold button to change level or double press to set level to max (only momentary switch). The device can save its state from before a power failure and restore it after power is back. Response to General Alarm command frame. 3 – ALARM FLASHING – the device periodically changes its status to the opposite, when it detects an alarm within 10 min. Response to Flood Alarm command frame. Response to Smoke, CO and CO2 Alarm command frames. Response to Temperature Alarm command frame. Determines how long the flashing will last in case of an alarm. 1.What is a Double Relay Switch module? Remotely Controlled Double Relay Switch of FIBARO System is designed to operate in a wall switch box or in locations where the control of two electric devices is needed. 2. What voltage Relay Switch module should be powered by? 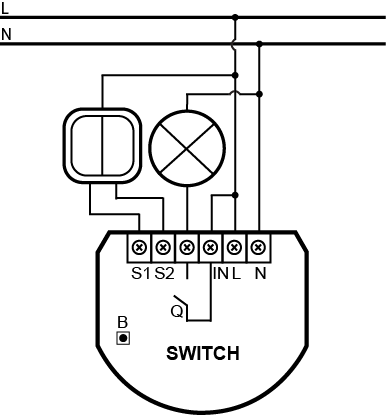 The Relay Switch should be powered from 110-240V AC (50/60Hz). 3. What are the differences between 2×1.5kW and 1×2.5kW? The main difference between 2×1.5kW and 1×2.5kW is number of physical outputs and load capacity. It can be any voltage up to 240V AC. No, only previous generation of the device was able to do so. 6. I want to control the lighting but I do not have Neutral wire. 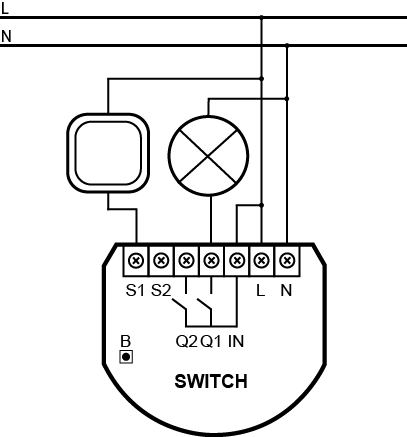 Can I connect Relay Switch to such circuit? No. The Relay Switch needs to be connected to Neutral Wire. To control circuits where there is no Neutral wire at the switch location please refer to the Dimmer module. 7. Can I control non-potential output by the Relay Switch module? Yes, you can – the relay is volt free by default. 8.What are association groups 1, 2 and 3 for? Group 1 is assigned to S1, Group 2 is assigned to S2 and Group 3 is only used for reporting module’s state to the controller. 9. What are S1, S2 for? These terminals are designed to be connected to the switch. S1 is designed to control O1 output, S2 to control O2 output.